An effective and repeatable swing is likely the hardest skill to master in golf. Golf swing training aids are used by everyone from the rank beginner to the best players in professional golf. It is only natural to try to find tools or gadgets to get a little help along the way. A good golf training aid can assist with proper body mechanics, getting on the proper swing plane, and also teaching you to swing with proper tempo. There’s no better feeling than stepping up to your ball, either on the tee or down the fairway and knowing the ball is going to go where you intend it to. I’ve featured some of the best golf swing trainers on the market on this page. Combine one or a number of these swing aids with a little hard work and get on the road to a better golf game. **Keep checking back, as I will keep refreshing this page to keep up with the best golf swing trainers on the market. Swing plane is one of the most important components of your overall golf swing. It affects everything related to the ball’s path, from the direction it goes to its trajectory to the distances it travels. Your swing plane is simply the vertical angle between the ground and the circular angle that the club head follows during the backswing, downswing, and follow through. Though the exact swing plane differs slightly for each golfer (mostly related to your height and body posture) as well as the club you’re using, the best golf swing plane trainers will help you find the perfect swing plane. Not only do these tools help you discover the optimum swing plane, but they also allow you to practice your swing while hitting this plane time after time again. The goal is to teach your body and mind that this is your new normal golf swing. In other words, the movements become muscle memory and the swing becomes second nature. Though there are dozens of tools created to improve your golf swing plane, not all of them are created equal and, of course, some are better than others. I’ve taken the time to test and review 4 of the very best golf swing plane trainers. The PlaneSwing is undoubtedly the premier golf swing plane trainer (in my humble opinion). It’s built from the ground up to maximize your swing by ingraining the perfect swing into your muscle memory. In fact, PlaneSwing starts working from the very get-go. You’ll find your swings on plane within just a few minutes of use. The movements are intuitive and easily repeatable. This swing training tool utilizes the typical hoop trainer design. It’s constructed from stainless steel for the ultimate in durability and overall value. Better yet, the PlaneSwing is simple. It’s got what you need to improve your swing – but doesn’t come loaded down with any unnecessary bells and whistles or gimmicks. The basic mechanics of this training tool involve the metal hoop and a weighted “power slider.” The goal is to keep the power slider in contact with the hoop throughout your swing. 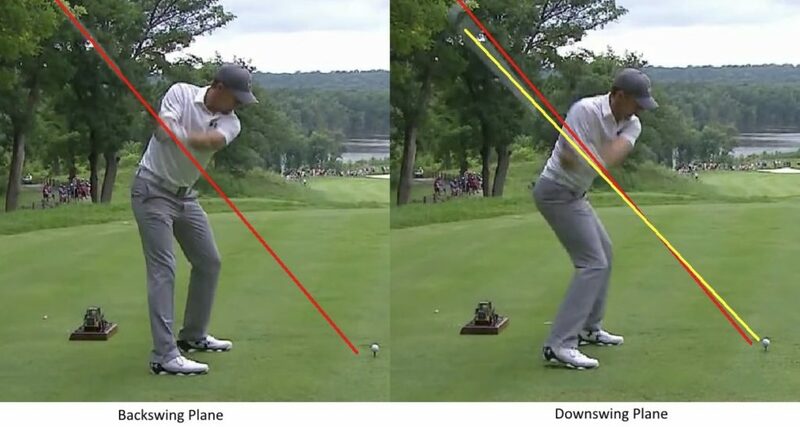 This is the exact same movement it takes to keep your clubhead on plane. Another beneficial feature of PlaneSwing is the “plane checker.” It provides you with a visual guide of where your “club” is at throughout the swing. This device is completely adjustable so that you can set it for the perfect plane for your height, posture, and swing type. Perhaps my favorite aspect of this swing plane trainer is that it forces you to use the correct muscles during your swing. You’ll then continue to use these same muscles when you transition back to using an actual club. 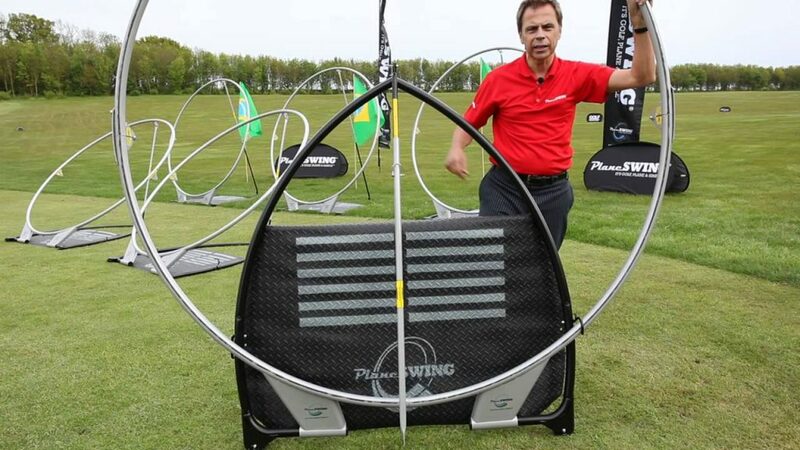 Despite the overall effectiveness of a hoop trainer, like the PlaneSwing, some golfers prefer a simpler and more straightforward trainer- and the Plane Perfector is a good place to start…. The Golf Swing Plane Perfector is a small, incredibly lightweight device that can be used just about anywhere, both outdoors and indoors. In fact, the main benefit of this golf training aid is its portability. It consists of a small swing plane measuring device and three alignment sticks. The Plane Perfector is 100% adjustable so that you can line up the perfect swing plane for your height and style of golf. Another immediately noticeable benefit of this training tool is the immediate feedback. You instantly know whether you’re swinging on plane and what you can do to fix this issue. Like the PlaneSwing, the Plane Perfector is all about making the perfect, on-plane golf swing muscle memory. Though the immediate feedback and extremely easy adjustability are nice features, this training aid does have one big disadvantage: it doesn’t tell you where to adjust the plane. In other words, you need at least a basic knowledge of the proper swing plane for each club so that you can set the device to check this plane. An alternative is to have a coach dial you in during your first use. This small setback aside, the Plane Perfector is a well-built device that’s very easy to use and provides immediate, extremely accurate feedback. We find it a good first step in improving your swing plane. If money is no object (I mean, you may have to sell your car), then it’s hard to find a more well-rounded, fully-featured plane trainer than the Plane Perfect Golf Machine. The model name says it all: this training aid is truly a machine. And a beast of a machine at that. The basic design utilizes a large hoop (on wheels for easy transport) that you actually lock your own clubs into. It then guides your swing along the perfect plane for each club. The fact that you can use your own clubs is one of the top benefits of using the Plane Perfect Golf Machine to work on your swing. An additional feature is a “backswing stopper” that stops your backswing at your desired height for an even more well-rounded and adjustable golf swing. You can create settings on the Plane Perfect Golf Machine so that it’s easy to set up on each new session, no matter the type of club you use. All in all, this golf swing training aid also focuses on building the golfer’s muscle memory but does it with more features than just about any other plane trainer on the market. Helps you groove a solid on-plane golf swing. 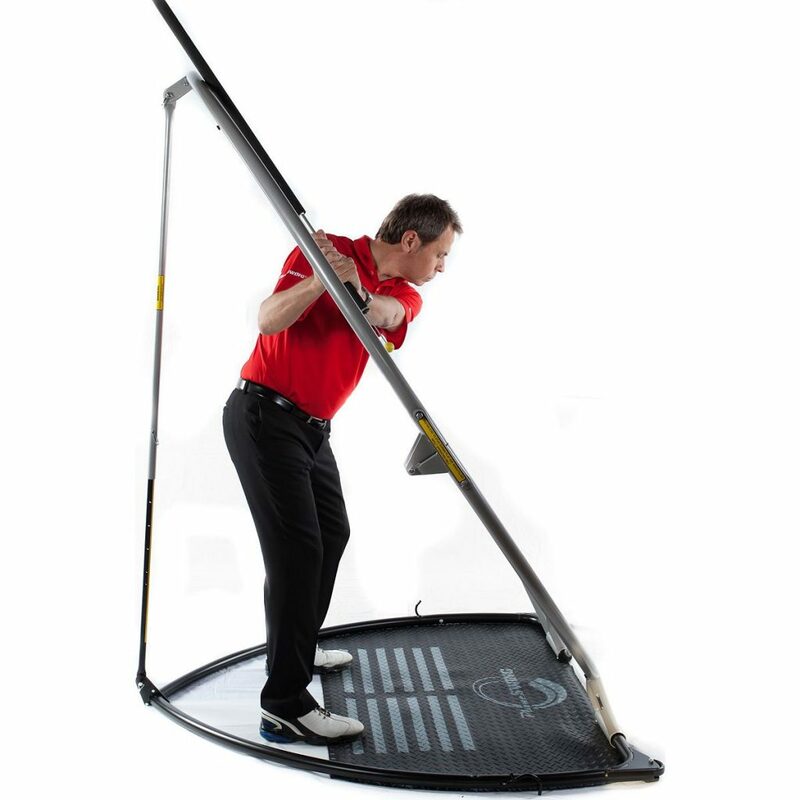 The Explanar Golf Training System is another one of the better golf swing plane trainers that utilize a hoop design. It’s sort of in between the PlaneSwing and Plane Perfect Golf Machine in terms of its complexity and set of features. The stated goal of this training tool is to help you throw out the bad parts of your swing and replace them with better form and mechanics. In this way, the Explanar builds you a new golf swing from scratch. The difference in not only your swing but also the distance and trajectory of your ball, are almost immediately noticeable. Like the other trainers I’ve reviewed here, the Explanar works by teaching you the new swing through repetition so that it becomes muscle memory in no time at all. Spend a few minutes per day using this tool, inside at home, and you’ll notice almost immediate results and benefits. The ease of use is so important because even once you think you have your new swing mastered, it’s essential to continue practicing with the Explanar so you don’t lose the perfected mechanics. Tempo is one of the hardest aspects of a golf swing to master. It’s all too easy to trick yourself into swinging harder and faster as the day goes on. Maybe it’s in an attempt to hit longer or maybe it’s completely subconscious. Either way, a golf swing tempo trainer can help. These training tools enable you to slow down your swing and keep it at the same speed throughout the day. Like plane trainers, these tempo trainer tools help you develop a more efficient swing through practice. They ensure that the swing is on-tempo each time so that this new swing develops into muscle memory. Consistency is key to the tempo of your golf swing – and that’s the focus of these training aids. Here are the three best golf swing tempo trainers available. Simple and straightforward in design, the Orange Whip provides a wide range of feedback about your golf swing. In addition to tempo, this tool also helps you perfect your swing balance as well as your swing plane. The Orange Whip is created to mimic the feel and motion of a driver. It’s weighted so that you can actually feel the swing and make the necessary adjustments from this information. Most notably, this tool helps with the transition between your backswing and downswing. It’s perfectly designed and weighted so that you don’t rush or stall this important transition moment. Because the Orange Whip is weighted, it’s actually a strength-building workout too. It takes a little time to get used to this extra weight, but the results will speak for themselves. Like the Orange Whip and David Leadbetter Swing Setter, the SKLZ Gold Flex Golf Trainer utilizes a weighted shaft design to improve your tempo. It’s comfortable, flexible, and just about the perfect weight. Practice your swing for a few minutes per day with this training aid and you’re sure to experience serious results on the course in short order. Like other weighted golf swing training tools, the SKLZ Gold Flex Golf Trainer does take some getting used to. It’s probably quite a bit heavier than you think (at least it was for me). That said, it’s easy to get used to after fifteen minutes of swinging. And from there using the golf trainer is all gravy. The key feature of this trainer is the exaggerated flex. The shaft has some serious flex to help lengthen your swing and create the perfect transition between backswing and downswing. The flex also takes the SKLZ Gold Flex Golf Trainer to the next level by enabling it to actually increase your flexibility and extend your backswing in addition to creating the perfect rhythm, tempo, and weight transfer. None, really. Does what it says and at a fair price. It has never been easier to get your hands on the very best golf swing training aids. There are countless pages of videos, testimonials, and training on how to use them, where to get them, and information on if they actually work. There is fierce price competition for your golfing dollar. The power is with us, the consumer.